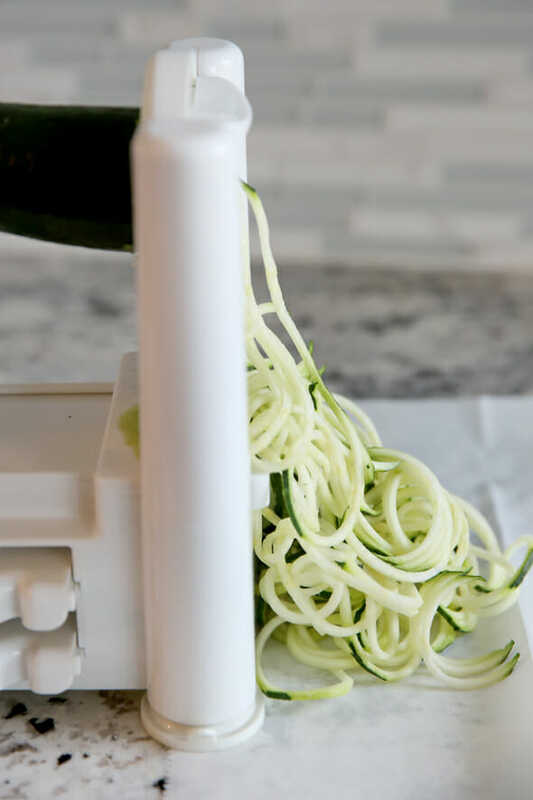 I started writing a post today about a recipe involving Zoodles (zucchini noodles) but then as I got going, I realized that the post itself was suuuuper long because I spent so much time talking about the zoodles themselves. So I thought I’d split it up. 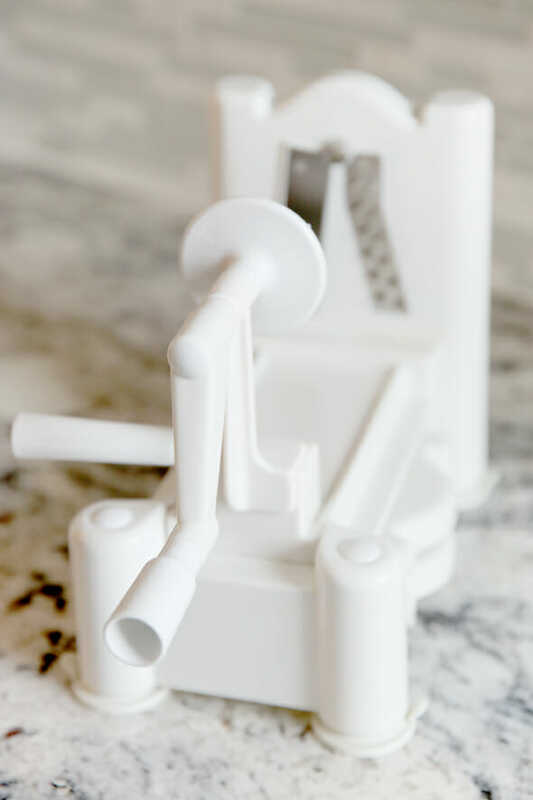 If you read food blogs and follow food bloggers on social media, you have undoubtedly been introduced to the Spiralizer. 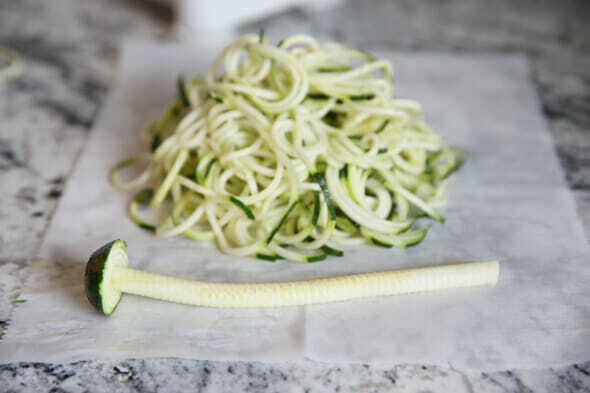 I myself have been making zucchini noodles long before the Spiralizer hype, I simply used a vegetable peeler to make thin ribbons, or cut the zucchini by hand, like I did in this recipe. So I always kind of thought that a contraption purely designed to turn vegetables into curly noodle-like ribbons was over-rated. Until I got one. And I take it all back. I’m in love with this thing and I use it almost every day. And some interchangeable blades on the other side. The one you see inserted in mine is the preferred one for zoodles. and out falls these beautiful curly noodle-like veggie strings. There’s very little waste, with simply a small core left in the end. And a big pile of what looks like, pasta! 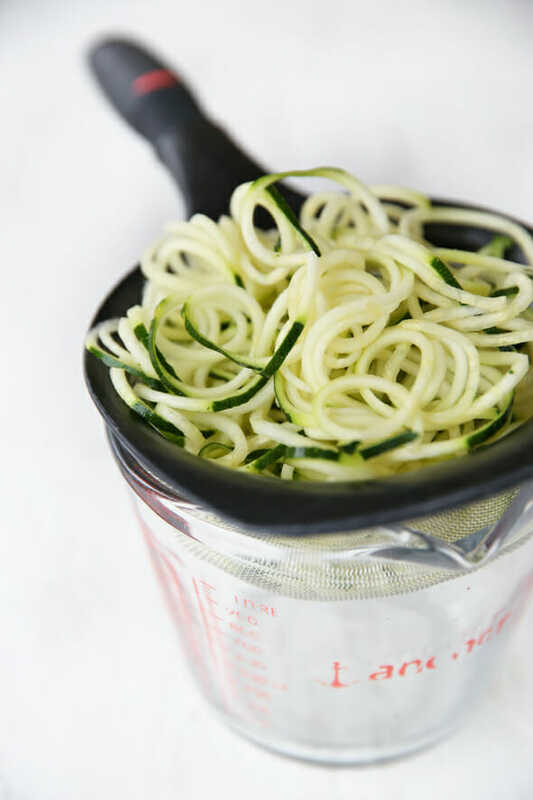 The spiralizer isn’t just for zucchini. You can use it for carrots, potatoes, apples, cucumbers, and more. There is also a ribbon blade, that works especially well for cucumbers and apples. 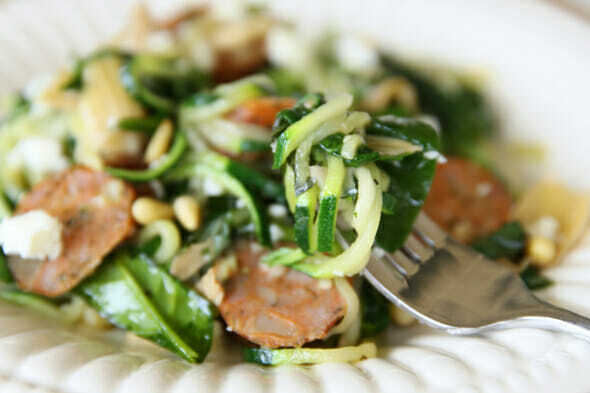 However since Zucchini noodles are all the rage, I’m going to share all of my best zoodle tips. This is an awesome little trick to have up your sleeve if you want to lighten up your own meal without totally making a separate one for your family. You can eat zoodles much like you would pasta, or simply as a side dish. They can actually be eaten raw or cooked. And I’m not lying to you when I say that they actually taste amazing when used in many traditional pasta dishes and they fill you up. Q: Where do you get one of those things? A: I bought mine from Amazon, here. There are a few different styles, but that Paderno seems to be the most popular. I have the Tri-Blade and I love it. A: I usually estimate 1 medium sized zucchini per person. It may seem like a lot, but once they are cooked (and especially if you use the method I suggest below to expel excess water) they shrink down a lot. Boiling: If I’m going to mix them with pasta, I plunge them right into the boiling water with the pasta as soon as the pasta is done. They only need to simmer for just a minute or two to get soft and can be drained right along with the pasta. Pan Cooking: This is my preferred method 99% of the time. Crank up the heat on your pan to medim-high. You don’t want to cook low and slow here, or the water will seep out and your zucchini will be mushy. Drizzle some olive oil (our flavored oils are absolute perfection here) and add the noodles. Use tongs to toss them and cook until just tender. It helps to use a pan larger than you think you need so there is plenty of room for them to spread out. If they’re piled on top of each other, they end up boiling and steaming and can be mushy. Cook them hot and fast like you would in a wok and then serve immediately. Q: Sometimes when I add a sauce it turns soupy, how do I avoid that? A: Zucchini has an incredibly high water content, so after cooking, if you add a sauce, it can turn incredibly thin. Try using thicker sauces, you can even simmer down tomato based sauces to thicken them up. The best trick however, is to plan ahead and expel some of the water from your zucchini, first. 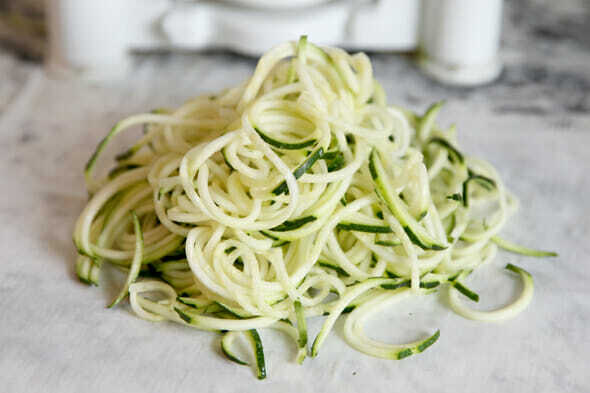 Toss your raw zoodles with kosher salt (I use about 1/4 teaspoon per small/med zucchini) and then place them in a mesh strainer that drains over a bowl. Let them sit for about 1 hour and you’ll see tons of water will drain out into the bowl. Transfer your zoodles onto a few layers of paper towels and then gently blot with paper towels on top as well. Saute as normal after that, then dress with desired sauce, and serve immediately. I don’t have any problems at all with wet noodles when I pre-treat them like this, though I only do that if I have a sauce that I want to stay thick. One of the beauties of Zoodles is that they can literally be made and cooked in less than 5 minutes, so I usually just pop them straight into a pan. It just depends on how I plan to serve them. Q: What do you do with them? A: Zoodles are fantastic simply tossed with a good olive oil* and salt and pepper. I also love them with pesto. I often mix in cooked chicken sausage links and top with parm or feta for a super quick and filling lunch. You can serve them like spaghetti and meatballs, make Asian style noodle dishes, or combine them with pasta to bulk up your serving. Hopefully that helps with any trouble-shooting you might have. I have literally been using mine every single day these days! In the next week or so I’ll share some of the yummy things I like to make with mine. How many of you are zoodle-ing?? HEY FIT CLUBBERS! Have you checked out this week’s workout challenge?? If not, go check it out and give our guest trainer some love! I had no idea that such a nifty contraption existed! But now I must have it. Yes, it’s not uncommon for me to run right out and buy whatever you girls say you like (it’s an illness, really! Hmm that’s odd, the second part of my comment was cut off. I wondered if you have the 3-blade basic or the 4-blade pro? I also would like to say I’m loving all the fit club stuff! Glad you’re enjoying Fit Club! I have the Tri-Blade Spiralizer. How much longer on the asian noodles, dying over here…. okay … so I’ve also been back and forth on the do I need another gadget thing so i’ve never broken down and purchased this one, but loved all your how-to’s which is why you ladies are so great … all the things I’ve seen but not really sure about … you clear up the need to have 🙂 love this post!! thanks so much for sharing … i’m also wondering, do you have the three blade version? I’ve been on the fence about getting one but I think I’ll be buying one today. =) Thanks for all your tips, tricks and simple ways to use veggie noodles. Can’t wait for you to share that recipes that’s pictures looks so good! When you do the salt trick to draw out the water, does it make the noodles taste salty? I have been thinking about getting an apple peeler, corer, slicer for making applesauce. If I don’t really care about the apples getting peeled, is there a blade on the spiralizer that would work basically the same way? Can’t wait for the Asian noodle recipe in the picture! It looks delicious. Most of the salt is drained right off with the water. A little is left on, but you’ll need to season the zucchini anyway so it all works out 🙂 I think a spiralizer works really well for an apple or two for a single dish, but if you’re wanting to do apple sauce and apple pie, I’d definitely go for the apple corer/slicer/peeler. I’ve tried these and I kind of struggle with them. I’m going to give them a go again with your tips! can’t wait to get that peanut zoodle recipe! Mine are just from the regular grocery store, too. They’ve been pretty good around here! I hope you are making money off of your recommendation, I read this and immediately bought one! And it came with free same-day delivery since I also ordered an ab roller 😉 I’m going to be fit in no time! Lol, I LOVE my ab roller, too! Great choices! 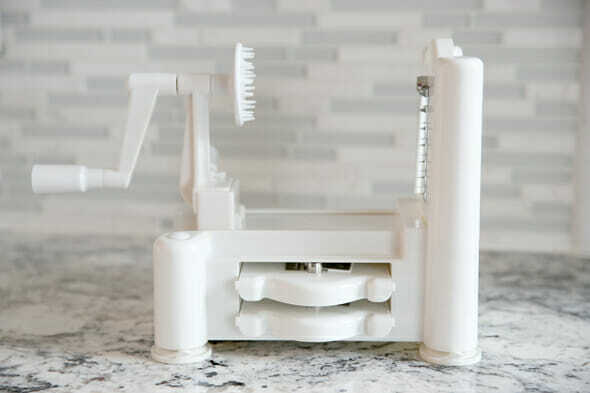 I haven’t tried it yet, but I think my apple/potato peeler/corer (which you guys recommend in your apple pie post) should also work to make zoodles. I usually have to adjust it when I’m peeling potatoes because it’s taking off too much peel, so I figured I can just make them that way (obviously I’d have to ‘reset’ it at the end of each zucchini, etc). 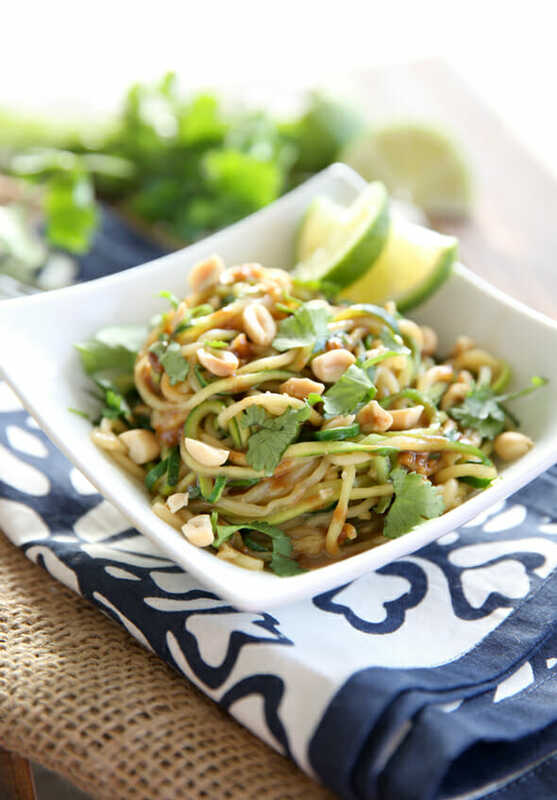 I bought the Spiralizer and practiced with a few zucchini and had partial curls but not too many noodles. Any tips to keep that thing in place and yield longer noodles? I have seen these and been googling them but am currently on a spending and gadget freeze. Plus my family processes to strongly DISLIKE zucchini but I LOVE it! Have you used it on carrots? And have you used one of the wider blades on apples? I’m thinking that would be a good way to get kids (or teenagers) to eat more fruits. I know my 15 year son LovES eating apples which have been thinly sliced on the mandoline. Thanks I think I might, just might end up buying this on Friday as my spending money drops in… woo hoo pay day!! Wow you have the fancy one! I have the vegetti. Got it for a gift and love it. Mix with mushrooms, tomatoes, red onion and green peppers – so satisfying. I’m not a poster – just love you guys! I honestly get complements every time I use one of your recipes. I don’t ever comment on blogs where I don’t know the person but I just want to say thy I’m loving all the healthy recipies and tips! I’ve loved your blog for a long time and know that whatever I make will be great so I’m excited to try all these new healthy dishes! Whaaaat? Grilled artichokes?? I am soooo excited about these, yum! Can’t wait to see if our local stores carry them! Just bought this thing and I was so excited to see you do a post on it. I was a little overwhelmed by the whole thing, but it is so fun and I LOVE using it. If you don’t want a big gadget taking up space, the Pampered Chef Julluenne Peeler makes great “spaghetti” type zoodles! It’s the size of a veggie peeler. Great article. 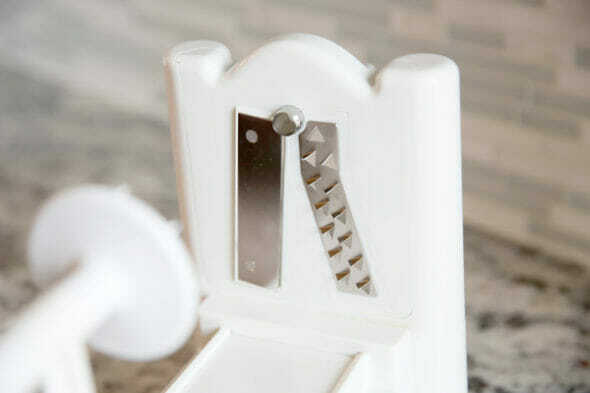 I saw a cutter on Pinterest over a year ago and purchased one at Amazon. Mine is shaped like a hour glass so you can make two different sizes of “noodles” depending on the end you insert the veggie into. I use it quite often. My wife likes a stir fry made with carrots and zucchini “noodles” sautéed with olive oil and garlic. I usually follow the same directions you included for pan frying. I toss the carrots in first so they can cook for an additional minute then add the zucchini. I also make a tomato based sauce with ground turkey. These contraptions are great for creating a substitute for pasta. Thanks for the very detailed post. I ordered one right away after seeing this post and tried it out last night. I turned the heat up high and fried them in a bit of olive oil. They were still very firm and I didn’t have any mushiness. I just ate them with olive oil, salt, pepper, and parmesan cheese. They were really good. Can’t wait to eat them again tonight. I tried these out today and they were awesome! I just used a serrated/julienne vegetable peeler and it made perfect noodles. I tossed them with leftover veggie-filled tomato sauce and it was a really tasty, filling meal. I’m really trying to eat more veggies and zoodles will be a regular part of the rotation! I just bought one today, the same brand, 4 blade version. 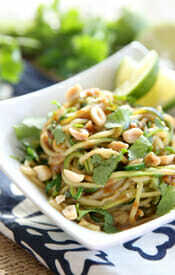 The zucchini was spinning wildly and yielded mostly partial noodles. We tried about 6 zucchini…what tips do you have? We liked the doodle pad Thai I made, but doubting the purchase… Thanks! If you are getting partial noodles (like half-moon shape?) it’s either because the zucchini is too skinny, or not centered. There shouldn’t be any way for it so “spin wildly” because it should have pressure on both ends. I promise it’s a fantastic purchase, works like a dream! If I was closer I’d show you in person to see if there’s something I could spot! Help! 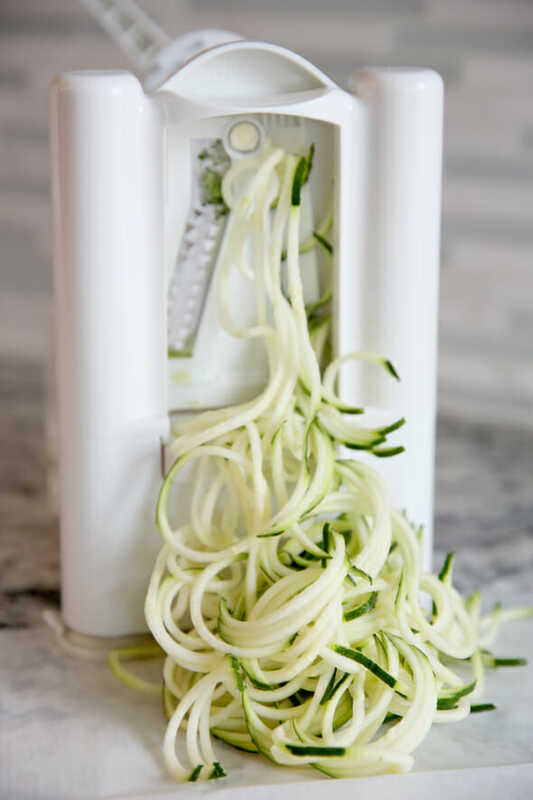 I was so excited to try making zoodles with my vegetti spiralizer to replace my beloved pasta, but I can never get it to soften to a pasta-like feel – just kept microwaving it forever and it never got beyond mildly crunchy. Any suggestions? I want carb-free spaghetti so badly! I would skip the microwave and either saute or blanch! jody–if you haven’t figured it out by now (as it’s months later), line a cookie sheet with several thicknesses of absorbent paper towels. sprinkle some salt on your zoodles, give ’em a toss to distribute, then spread them on the toweling. ‘sweat’ them in a 200-degree (fahrenheit) oven for 30 minutes. THEN sautee them–i don’t use microwaves–in a teeny bit of olive oil with crushed garlic. to die for!!! 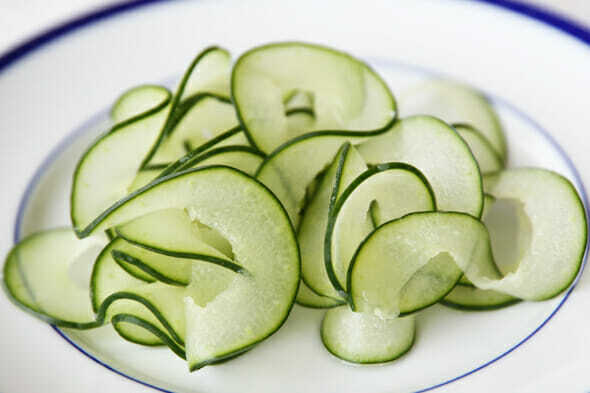 I just ordered a spiralizer and have been looking up recipes for the zucchini (and other veggies) that we just planted in our garden. I have never done this before. Thanks for the tips!! I’m afraid that I am going to have to go buy some zucchini because there is no way I can wait for the garden now!!! I have a cheaper version, and it works for zucchini, but not for sweet potatoes or other vegetables. They seem to be too hard and I can get them through the blade. Does this work with any other vegetables, mainly potatoes or something harder? Yes, I use it for sweet potatoes quite often. It takes a strong hand, but it works!